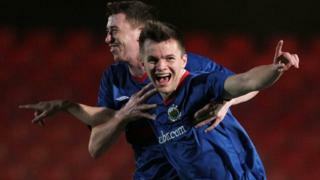 Highlights from Windsor Park as Linfield beat Lisburn Distillery 4-0 in the Irish Premiership. The Blues' first goal was a stunning free-kick from Niall Quinn, and further strikes by Andy Hunter (own goal), Brian McCaul and Ryan Henderson ensured a comfortable winning margin. The win sees Linfield move up to fifth in the Irish Premiership table, while the Whites remain rooted to the bottom.